Just a short three-and-a-half mile drive south of East Jordan on M-66 you will find a place that is rich in American history and will also give you and opportunity to try your hand at trout fishing. 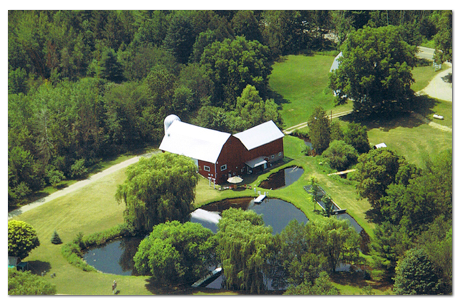 Owned and operated by Loren Hughes and his wife Kay, the Jordan Valley Trout Pond and Hughes Family Farm is just that place. The rainbow trout ponds on the farm are fed by natural streams (Bennet Creek) of spring water that continuously flow through the ponds at a rate of 1,000 gallons per minute, resulting in a constant fresh water supply for the trout. In addition to supplying the ponds fresh water, Bennet Creek is also used to nurture and raise fresh stock from eggs. The Hughes family produces and incubates all of its own trout eggs. The eggs are shipped overnight from Seattle and it takes 21 days for the eggs to hatch. It takes two years for the trout to reach a length of 14 inches or more. This process of raising fish is done once a year in the spring. Once hatched, the fish are raised in one of three large tanks of fresh water, held inside the lower portion of the Hughes family barn. The trout are fed pellets of various sizes, varying from fine dust like particles to small pellets. The feed consists of high-protein ingredients made from soybean meal, wheat middlings, fish oil and wheat flour that includes vitamins A, D, E, and C. This process of growing trout results in fresh, nutritious, healthy rainbow trout (as those who have fished the farm or had the opportunity to dine on fish taken from there can happily attest). Once the fingerlings (young trout) are old enough, they are raised in protected areas out on the grounds until they are big enough to exist in the larger ponds with adult fish. Customers are offered a few different fishing options. Tackle and poles are furnished, or you can bring your own. Catch-and-release or catch-and-keep practices and philosophies are taught to young anglers. Fish cleaning and even frozen fish are available. Records are kept of the "Big" fish caught in the ponds, and it is displayed for all to see on a record board inside the lower portion of the barn. There are also many pictures of those catches as well as photos of how the operation began. The 200 acre property was purchased by Mr. Hughes' parents in 1935, and he worked on the farm as a youth up until he graduated from Michigan State, and again after he retired from his position as a General Motors' financial executive in 1992. The fishing business was established in 1961 and it helped supply the State of Michigan with fish. There is also much more to this farm than the trout fishing activities. In a way, with all the fishing fun available, many miss the opportunity to see that it is really a historic landmark, too. The property is the original Bartholomew farm. Its original barns are displays of rural archeology dating back to the 1800s. Tours are offered and one can see the beams overhead are original and hand-hewn. The beams are also held together by pegs instead of nails or screws. Another fascinating feature is the history written on those beams. The 120-year-old writing on the beams is a way of dating the landmark -- like a recent form of hieroglyphics -- and you can find names of cattle and updates of new calves being born among other typical farm news. Mr. Hughes' father continued the tradition of marking the beams when something needed to be recorded, such as the replacement of the original roofs on the barns. In addition to the trout farm, Mr. and Mrs. Hughes tend a five-acre produce plot as well. They have a self-serve vegetable stand out by the road that has become famous over the years for its delicious and mouthwatering selections. One testimony to how delicious the farm fare is comes from some local raccoons that paid a visit recently to help themselves to the tempting sweet corn! The farm and its operations can be found on M-66 just three-and-a-half miles south of East Jordan. They are open 10 a.m. to 5 p.m. Monday through Sunday from the last Saturday in April to Oct. 31. No license is required. You can reach Loren and Kay Hughes at (231) 536-0518 or Ray Alward at (231) 459-5188, or you can visit them online at www.jordanvalleytroutpond.com. All visitors are welcome. As it bends and babbles its way from the high hills that rise behind Kidder and Vance roads, Bennet Creek brings its fresh, crystalline water through decades of Antrim County history as well as the Hughes' trout farm. This stream is the backbone of the trout operation, but it also is its link to some of the earliest Antrim County settlements. Owner Loren Hughes said, "The stream has looked that way and been at that level for as far back as anyone around here can remember." Its cool water not only feeds the ponds fresh, oxygenated water, but it is also used to nurture fresh stock from eggs. The trout at Jordan Valley are treated as if they are members of an exclusive fish spa. According to Mr. Hughes, "The fish are raised from eggs shipped over-night from Washington State. They are all prime, rainbow trout. Once hatched, they are constantly monitored in three tanks where stream water is gravity fed and circulated." Out on the grounds, the fingerlings are brought along gently in protected areas until they are of a certain size that allows them to exist in the larger ponds with adult fish. "They are fed a high-protein food, which gives them excellent flavor, and they are almost all females, which means they have more meat," according to Hughes. For many fishing purists, the idea of a commercial trout pond might curl their lures as they envision teeming, overcrowded artificial casks of suffering fish, but at Jordan Valley, they might just find that their prejudices are unfounded. 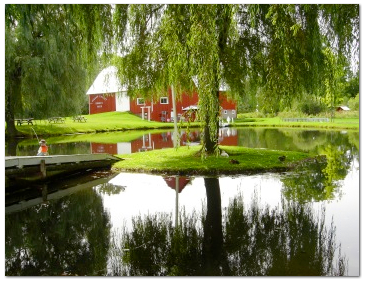 The grounds are spotless with grassy, unfertilized grounds shaded by large willows that gently waft their graceful limbs over the spring-fed ponds. Loren and his wife Kay Hughes are committed to making their business an enjoyable stop for young and old; those who have never caught a fish and those that are interested in honing their skills. 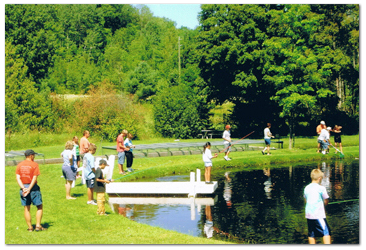 Patrons are offered fishing options. Tackle is furnished, or your own can be used. Catch-and-release or catch-and-keep practices and philosophies are taught to young anglers. Fish cleaning and even frozen fish are available. According to Loren, "We guarantee to catch fish. Our staff knows all the tricks." As is the case in so many Antrim County farms, here again is a source for local food that carries with it the security of knowing where your food comes from and how it is treated. This is not a fish factory in a far-off land that ships their product thousands of miles to chain store meat coolers. As well, these are farmers who are part of the community, even to the point of sponsoring their own scholarship through the Community Foundation. There is much more to this farm than the trout fishing activities. In a way, all the fishing fun is a masquerade for what is an historic Antrim County landmark. This is the original Bartholomew farm. Its stately, original barns are displays of rural archeology that date to the 1800's. On the grounds was once an eight-bedroom home that boasted two living rooms. It had to have been, in its time, one of the stateliest abodes of Antrim. The Hughes' have great respect and knowledge of its history, and actually turn the profits from the fishing operation back into its maintenance and preservation. On a tour, Loren can hardly contain his enthusiasm for the lore contained in its buildings. "You see these beams? They are original, hand-hewn, assembled with pegs. Now look closer, and tell me what you see." There, on the lowest level of the barn, handwritten in pencil on the beams were the original dated recordings of calves that were born in the 1800's. It is like looking at some type of Americana hieroglyphics, and you are standing in the exact place that the farmer stood when he reached up and stenciled his historic mark well over 120 years ago. As Mr. Hughes walked the grounds, the history seemed endless, from silos, to equipment to original roofs, to gardens. The farm is a museum honoring the rural past. And none of this included the storied family history that brought the Hughes to this place. Names from the Norwegian Road area like Grandfather Ole Omland who came up from Chicago to raise milking cows and worked with Uncle Albert Omland and neighbor Jake Wagbo form the basis of a romantic, hard-working origin. After working on the farms a kid, Loren (Known formally as Russell Loren Hughes) and his wife Kay (an East Jordan native) are now pouring back tender loving care to the farm. After a long 40-year career at General Motors in executive finance, Loren now considers the farm and trout ponds "a hobby". (He and Kay tend to a five-acre produce plot as well. The self-serve vegetable stand out by the road has become famous over the last 13 years for it scrumptious selections. And through it all, Bennet Creek keeps carrying the history and nourishment of this farm along. 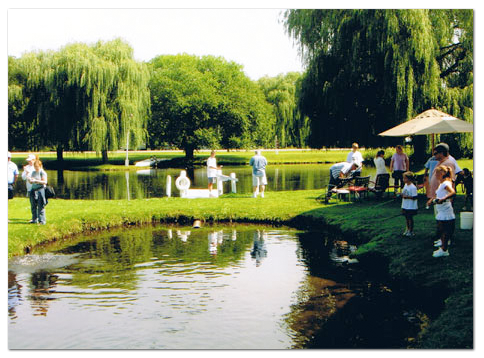 Visitors step back in time when they step onto the banks of these trout ponds. The farm and its operations can be found on M66, 3 ½ miles South of East Jordan. They are open in season from 10:00 a.m. to 5:00 p.m. You can reach Loren and Kay Hughes at (231) 536-0518 or Ray Alward at (231) 459-5188. The Hughes' welcome all visitors.